A stay at INTER-HOTEL Longuyon de Lorraine places you in the heart of Longuyon, a 1-minute drive from Longuyon City Hall and 9 minutes from Ouvrage Fermont Museum. Featured amenities include a business center and complimentary newspapers in the lobby. Free self parking is available onsite. Located in Sermaise, Gite La Source de Marzée Cottage is in a rural location, within a 10-minute drive of Castle Montivert and St-Symphorien Church. Free self parking is available onsite. When you stay at this cottage in Malaussanne, you'll be within the vicinity of Museum of La Faience et des Arts de la table. 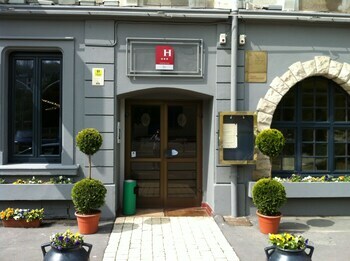 A stay at L'annexe du 8 places you in the heart of Besancon, convenient to Pelote Tower and University of Franche-Comte. Free self parking is available onsite. A stay at Résidence du Théâtre places you in the heart of Colmar, steps from Theater Colmar and Unterlinden Museum. With a stay at Hôtel Le Home, you'll be centrally located in Vincennes, within a 10-minute drive of Parc Floral de Paris and Bois de Vincennes. With a stay at this bed & breakfast, you'll be centrally located in Paris, within a 10-minute drive of Moulin Rouge and Parc Monceau. With a stay at Hotel le Chapeau Rouge in Chateau-Landon, you'll be 11.3 mi (18.2 km) from Chateau Montargis and 11.5 mi (18.6 km) from Praline Market. The front desk is staffed during limited hours. When you stay at Auberge Lou Peyrol in Montferrand-du-Perigord, you'll be 9 minutes by car from Cadouin Abbey. Free self parking is available onsite.